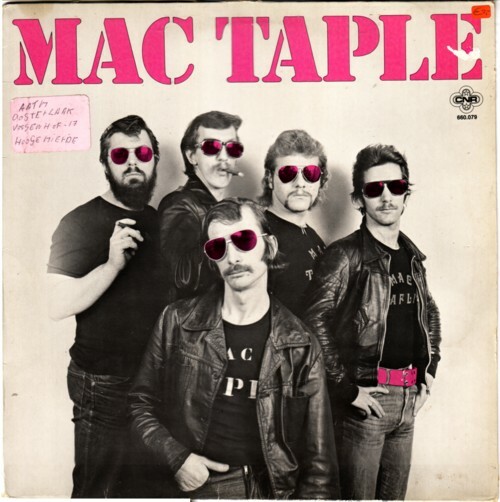 When I did a Google search for the band Mac Taple I found enough info to write a book about the band, but that is not my plan. I just have this LP, their first, made in 1979, and I like it quite a bit. The LP was produced by Louis Smeets. I remember that he had a rock’n‘roll radio show in those days (late seventies? ), but my memories are very incomplete. I recorded the show sometimes, but I have none of these tapes left. If anyone remembers more about these radio shows, I would love to hear that. What I like about Mac Taple, as they sound on this LP, is the sound and the voice of the singer. He reminds me of the singer of the Polecats. And so does the lead guitarist. Of course, Mac Taple plays straight old style rock’n’roll, but their sound is here and there more than a bit Glam Rock. Very much what I love to hear! Listen for example to this song, Life in the jungle, an original composition of the band. Herman Brood plays the piano on two songs, by the way. But hey, you can’t have it all!